Twist’s “Symphonie Fantastique,” which first debuted 20 years ago at the HERE Arts Center, is the artist’s vision realized on a large scale. In this production, a team of five puppeteers—Kate Brehm, Ben Elling, Andy Gaukel, Jonothon Lyons and Lake Simons— perform Twist’s creation not in a cracked aquarium, but in a 1,000-gallon tank of water. They don wetsuits and soar over the tank, dipping pieces of fabric, feathers, and tinsel in conversation with the music to create a complex, intricate choreography. Audiences don’t see this labor, but they see its results: A hypnotic, phantasmagorical display that populates a large screen. 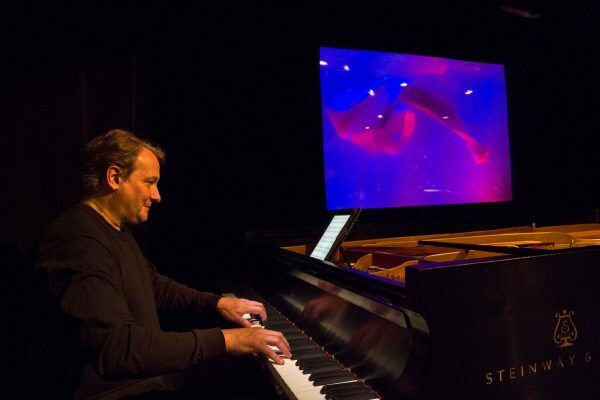 In a new twist on the original show, which used an audio recording of Berlioz’s symphony, audiences are treated to a live performance of the musical work by the virtuoso pianist Christopher O’Riley. Though O’Riley is front and center during the show, audiences are only likely to pay him any direct attention in the brief moments between the symphony’s movements, when the curtain falls. During the first of these interstitial moments, O’Riley appears to look toward the heavens, in a kind of silent prayer. In the second, he examines his hands, as though seeing them for the first time. In the last, his beaming grin gradually morphs into a ghoulish grimace. O’Riley may, as Mr. Twist suggests, be seen as a stand-in for the love-struck protagonist of Berlioz’s symphony, who, according to Berlioz’s program notes, “poisons himself with opium” and then falls into “a heavy sleep accompanied by the strangest of visions.” But audiences who don’t know that backstory may simply see his movements as a slightly befuddling comic antic. Berlioz’s story of infatuation and heartbreak is also meant to inform the music, and therefore the progression of Twist’s puppet show. But audiences can see and enjoy “Symphonie Fantastique” without knowing that story, and may find even greater pleasure developing their own interpretation of the sights and sounds they experience. It is, for instance, easy to imagine many of Twist’s puppets as lifeforms. In the beginning, simple pieces of circular plastic may be seen as single-cell organisms. Later, swatches of fabric resemble fish as they appear to swim through tangles of seaweed. And then there are the feathers, which obviously evoke birds. Through this lens, it’s possible to see Twist’s narrative as a story of life on Earth—a tale of creation, evolution and death. The great thing about “Symphonie Fantastique,” of course, is that audiences can make of it whatever they like. They can choose to find a story, or they can simply sit back and enjoy it on a purely sensory level. Twenty years after its first performance, it remains a uniquely magical experience, one perhaps best consumed with an mind open to beauty for beauty’s sake. Symphonie Fantastique runs to July 15, 2018. More production info can be found here.